Fixtures and opening times for week starting 18 June. The bar will be open this week on: Sunday from 12:30 to 5:00 – opening earlier than usual for the England match Monday, Tuesday and Friday from 7 pm. All welcome. This week we are open Sunday from 1 pm, Mon, Tue, Wed and Fri from 7 pm, Sat from 4 pm Come and watch the England game on Monday. Great video for people interested in playing bowls. 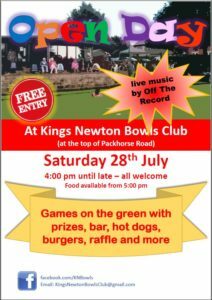 © 2019 Kings Newton Bowls Club.